So I've noticed Animal Crossing: New Leaf can be reduced to a simulator where I repeatedly bring sacks of exotic beetles to Goodwill and get a sack of money in return. I really hope I get some cooler neighbors soon. Also, I'd like to thank Rare Candy Treatment for the shout-out to last week's comic. Their take on the newly announced fairy-type is great, too. Check it out! Oh, and what's this? Two reviews for the price of one! (Except for me -- I still had to pay for two things to review.) 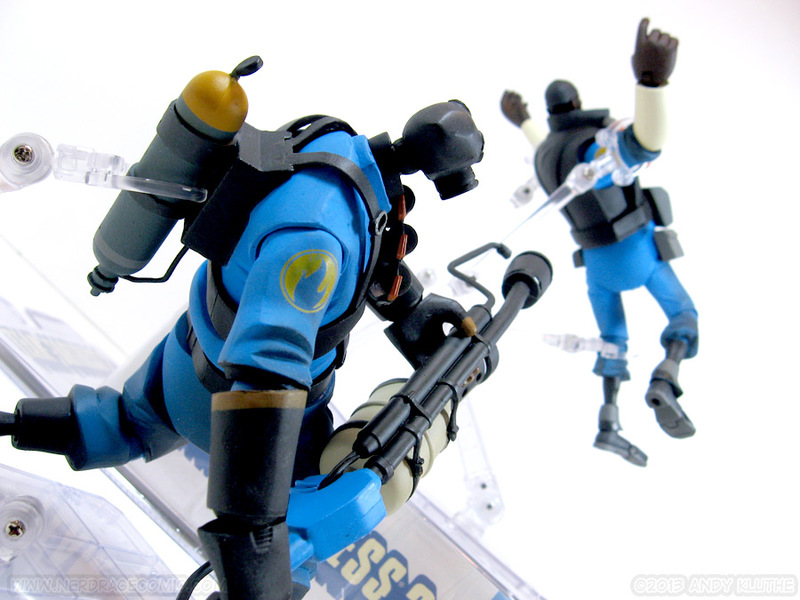 Skip below for a look at NECA's Pyro and Demoman from Team Fortress 2! I had a couple people ask if I’d be reviewing these guys. I ordered the BLU versions, so it’s taken a while for them to come out. Anyone who’s read anything about the original RED versions (myself included) knows basically what things to expect. 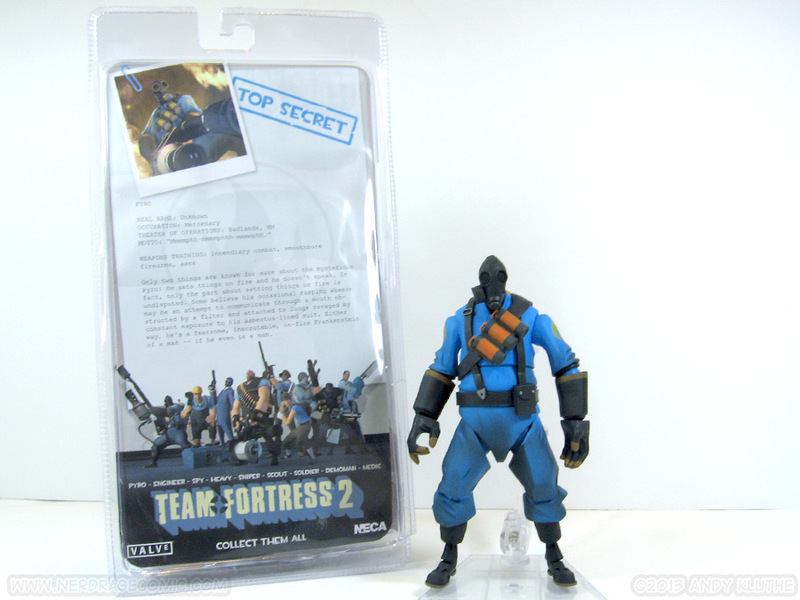 They do come with vouchers for digital hats (wouldn't be a TF2 product without 'em.) and they are different from the RED version hats. 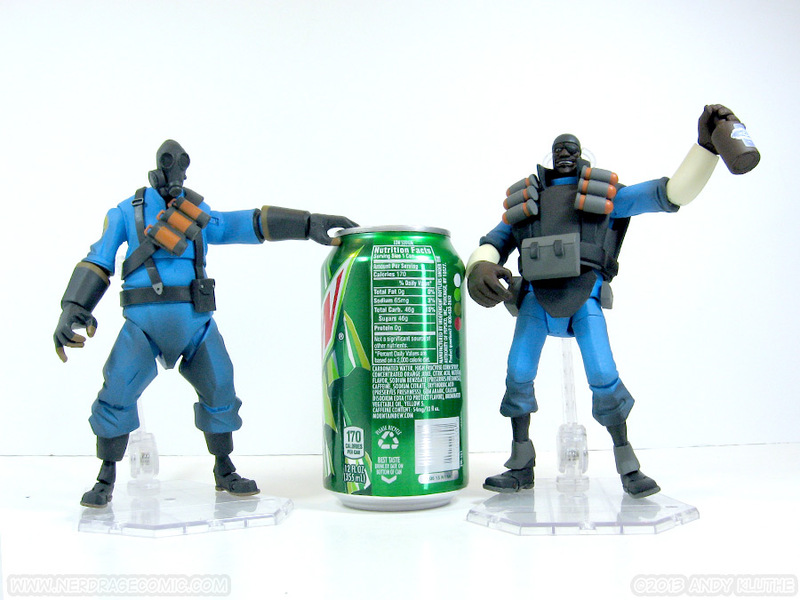 Oh, also, these guys aren’t going to stand on their own. Mine are supported with Tamashii Stages from Bandai. 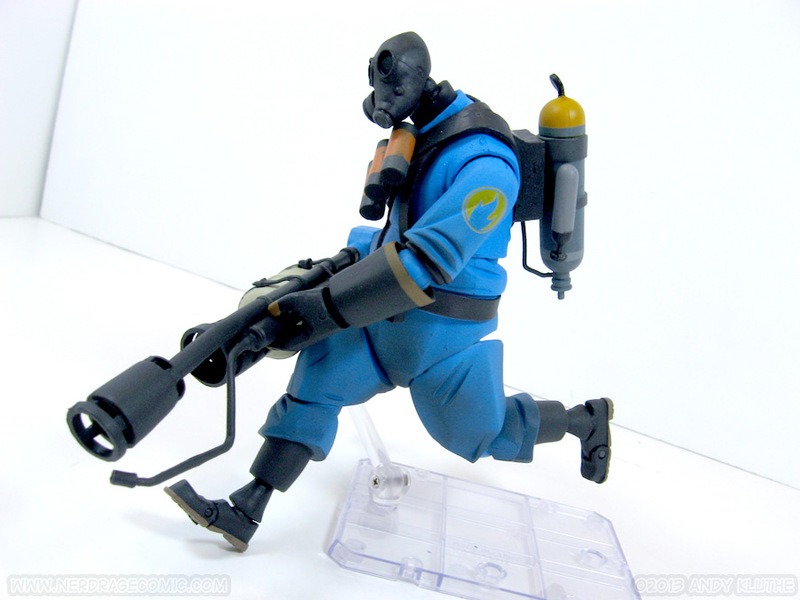 Articulation is one of the two biggest issues with these figures. 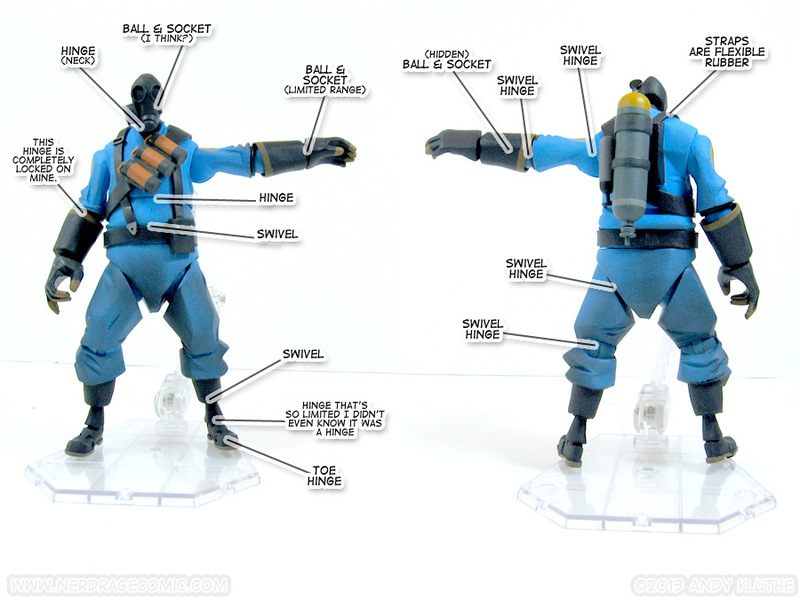 NECA keeps trying to do new and better articulation, but somehow take a couple steps backwards in the process. Joints don’t seem engineered with a wide-range of movement in mind. Both came with stuck joints out of the package – in some cases I wasn’t exactly sure what actually was a joint. 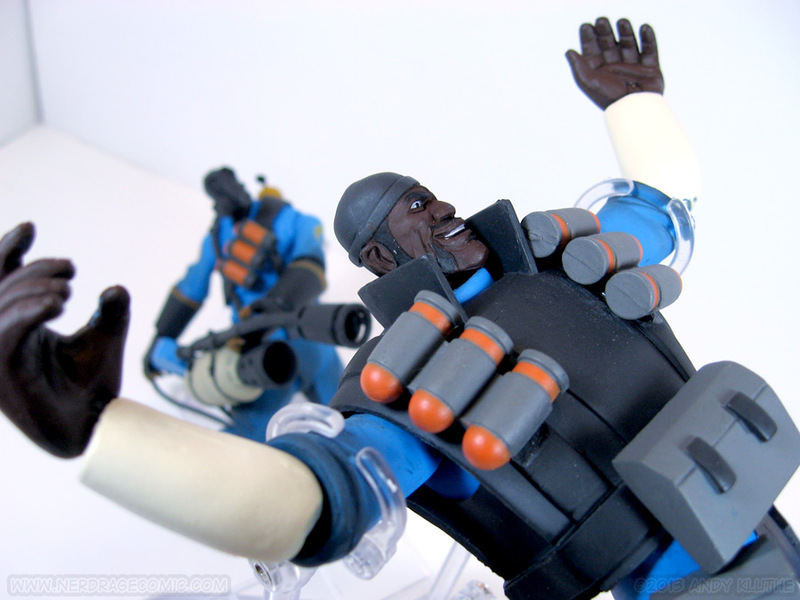 Demoman’s elbow joints were painted over. Good luck getting the arms in front, because the elbows have very limited range. 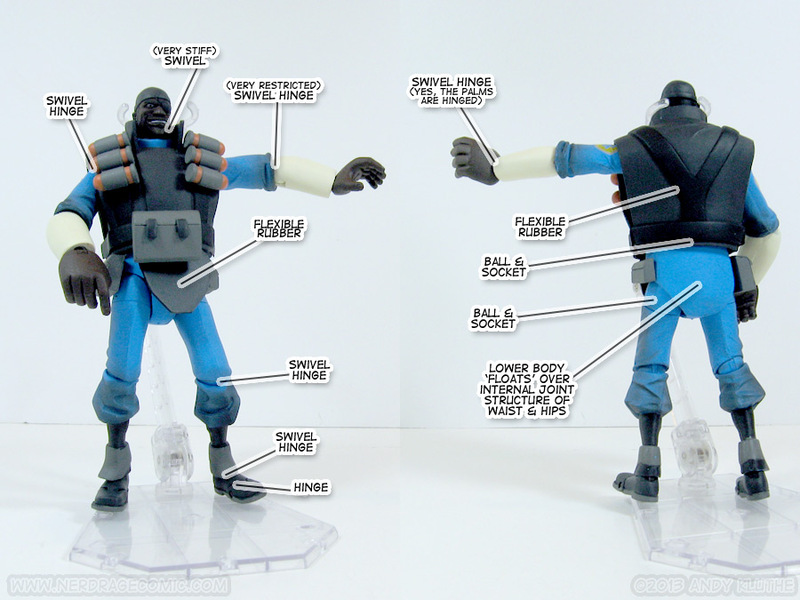 There seems to be a hidden ball joint in the glove beneath the exposed ball-hinge joint. One of my hinges is locked and I can’t unstick it. Thankfully his (her?) 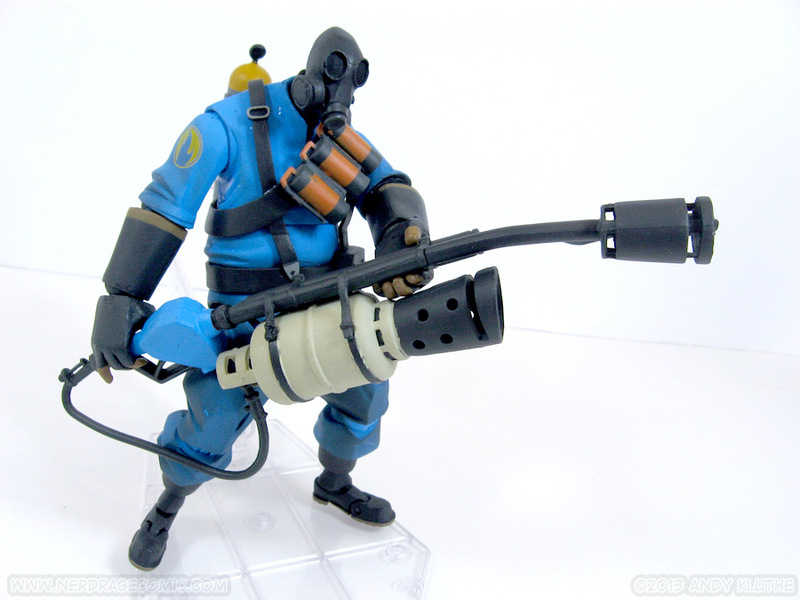 hands need to be fairly far apart to wield the flamethrower. 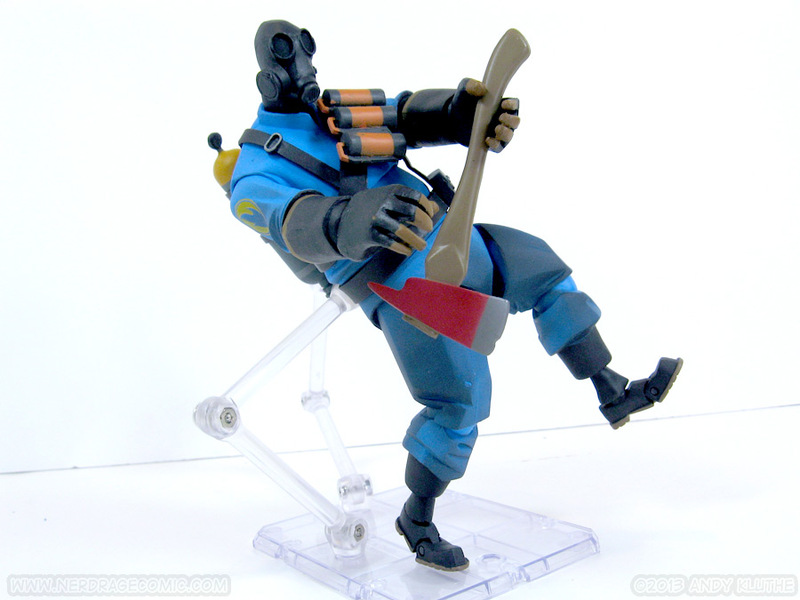 You can also pose the Pyro with the fire axe. Well, almost, since there’s only one set of hands and only one hand kinda holds it. The hips have a joint that’s both hinged and swivels on both ends. Mine was initially locked up and the hinge can be hard to see, so it’s something you might just pass off as non-articulated if you don’t work it over. 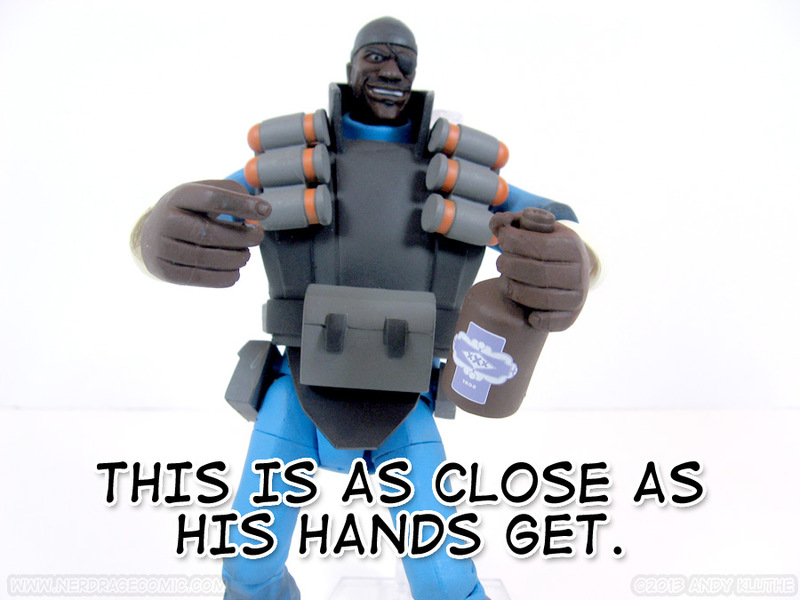 Demoman suffers from the same elbow issue – doubled -- because they were painted over. You get minimal range with the arms, don’t expect the Demo to do anything that involves reaching in front of his chest. If you turn the waist you can get the guns pointed forward, but there’s just not enough give in the arms/shoulders to point ‘em that way, otherwise. 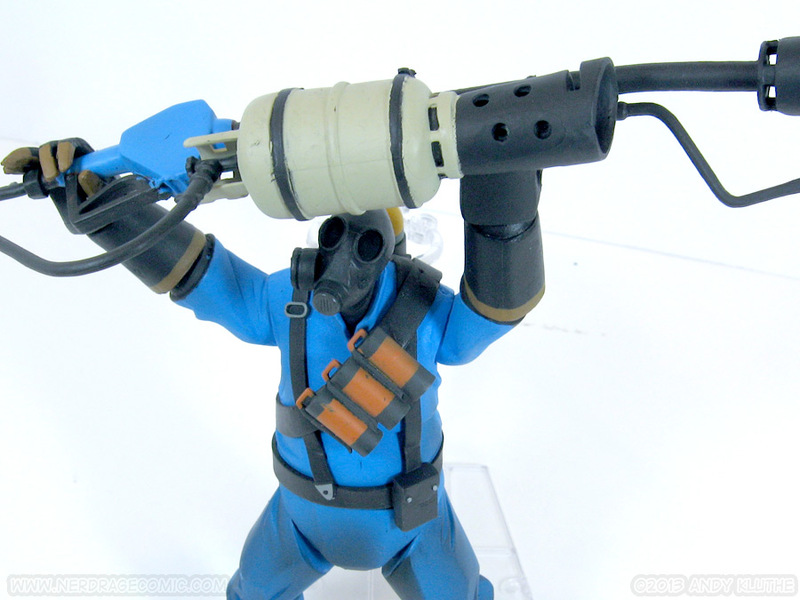 He can also hold the included sticky bomb launcher with two hands by swapping for an alternate hand. 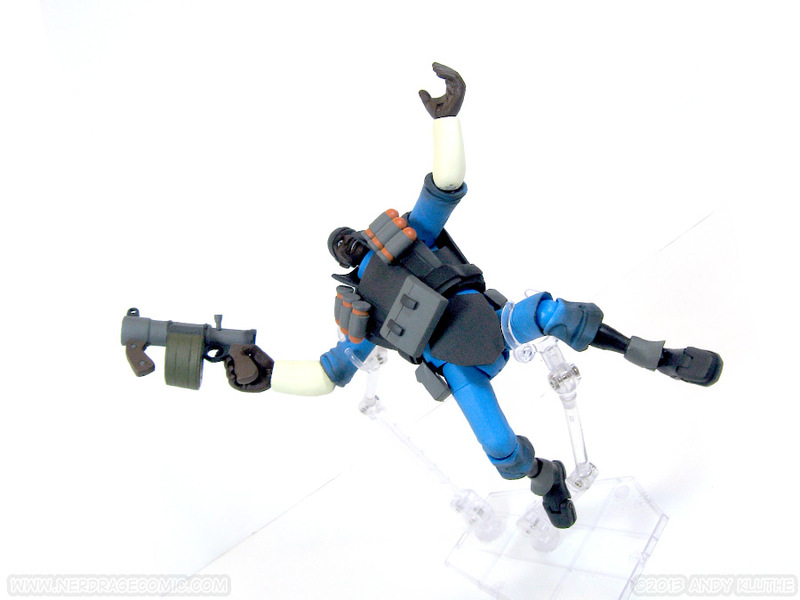 The wrists have actual hinges instead of relying on ball joints, so you get some decent range there. Finally, you get the bottle o’ scrumpy (translation for non-Scottish stereotypes: a bottle). It’s being held in a drinking fashion, not a skull bashing fashion yet there is no way to get the top near his mouth. 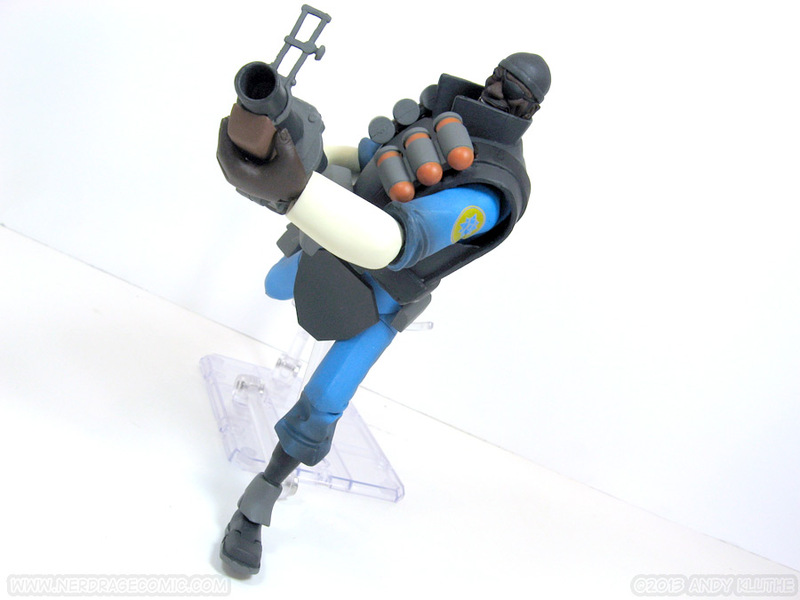 The demoman’s lower body is interesting because it seems to be floating over an internal joint structure, giving some nice subtle bend to the waist and back. It’s engineering like this that makes me wonder why elbows are still such an issue. Functionality aside, the sculpt looks great for both figures. I really like the angular styling; it really captures the art of the game. 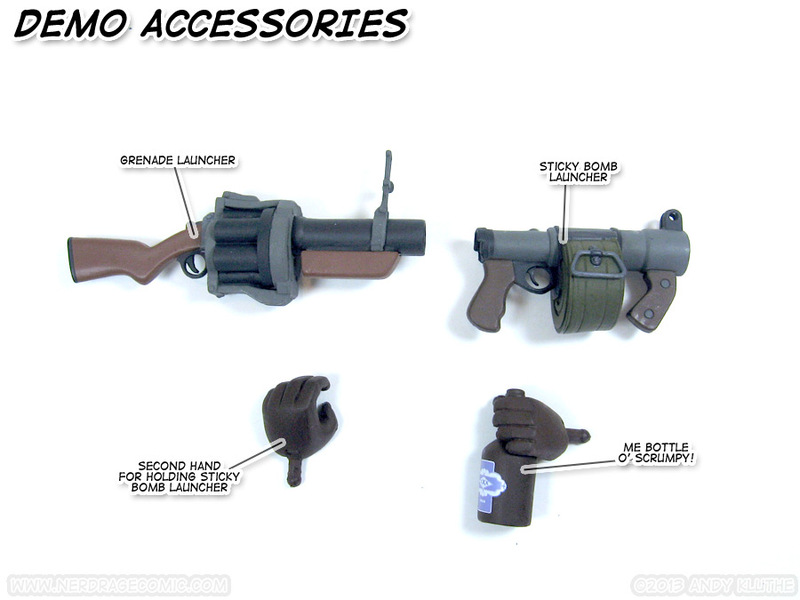 The pyro’s belt and straps are a soft, flexible material. The demo’s entire vest is made of this same soft material. The paint jobs look good, too. 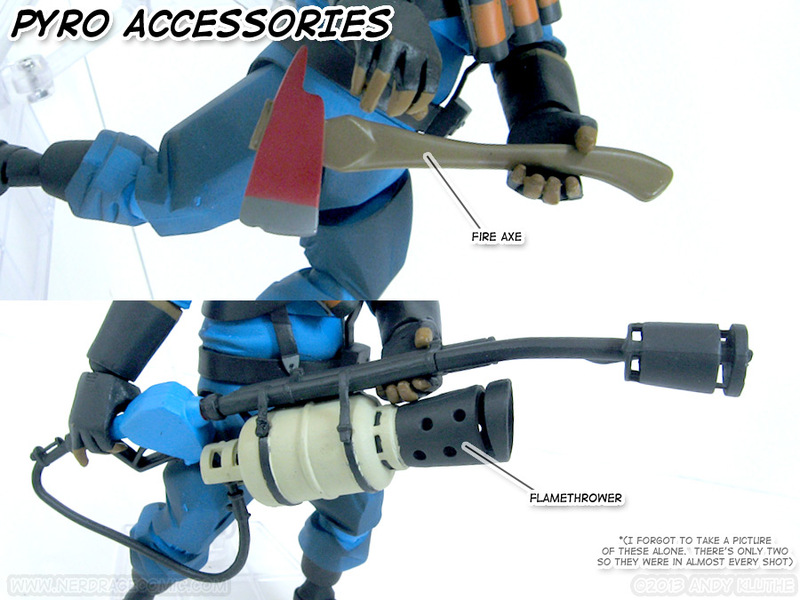 The weapons are fully painted and very detailed, belt straps and other details are painted the appropriate colors. The matte finish looks great, and there’s dark airbrushing to simulate the sooty burn of headwear-based combat. Where they severely fail is paint-wear. 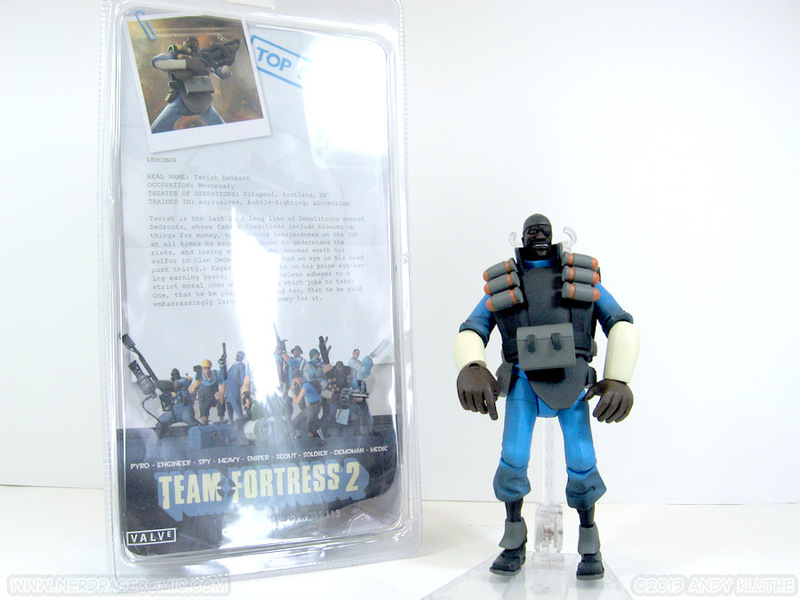 Demoman in particular had paint wearing off minutes out of the box. As mentioned above, his elbows were sealed with paint. His right gun-holding hand now how paint wearing off on the inner fingers. 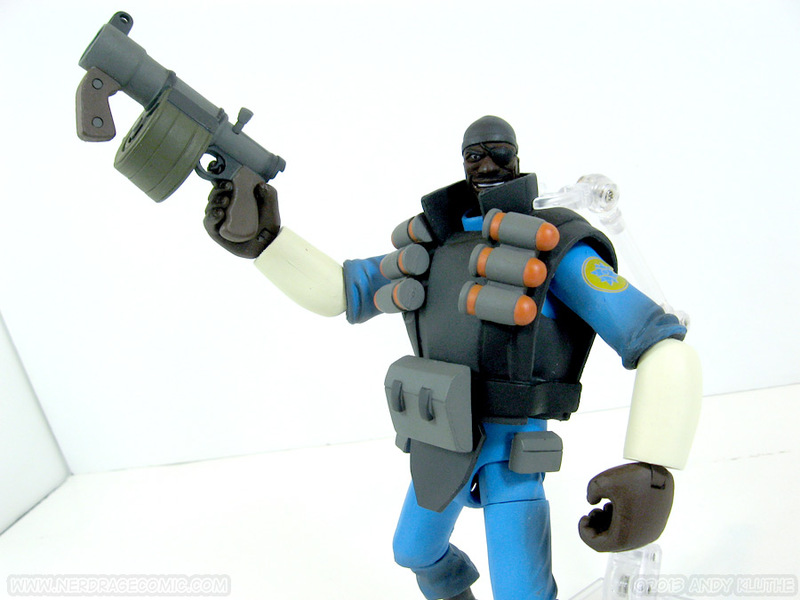 Get this – his hands are blue plastic painted the appropriate skin color. Why would you paint a semi-flexible, solid-colored component that faces regular friction from accessories? 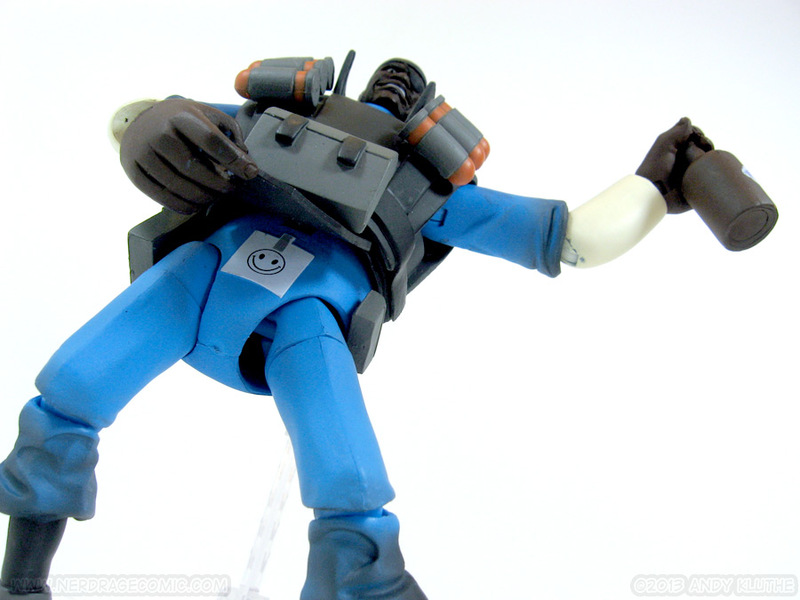 The pegs that go into his wrists are also painted skin color, yet are clearly brown plastic underneath (?!). Paint chipping and general wear seems like it will be an issue. My last complaint is that the shade of his skin is too dark. The hat, eye patch, facial hair, and hair all kinda blends together; there should be more contrast. I had a lot of trouble getting clear images because the colors all bleed together. 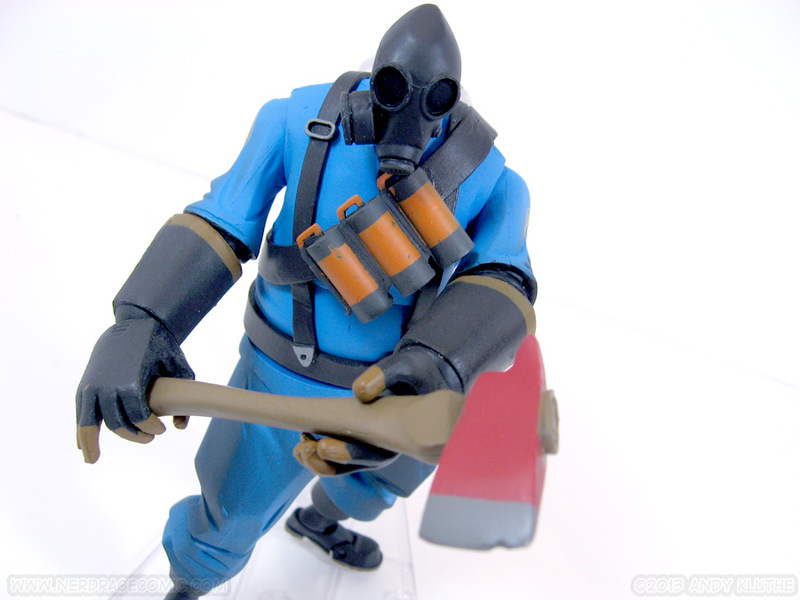 Pyro comes with the stock flamethrower and fire axe. 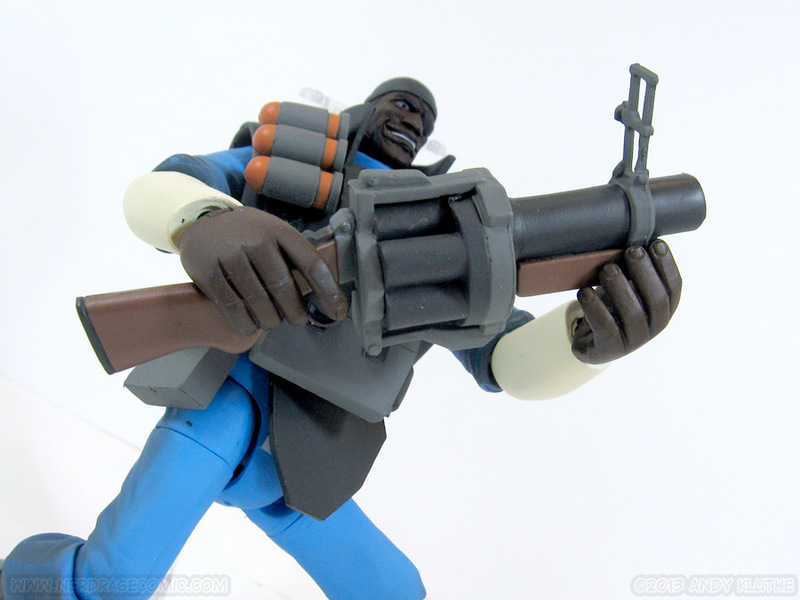 The shotgun is entirely absent, which seems a little odd considering how the Demoman even comes with extra hands to accommodate his artillery. 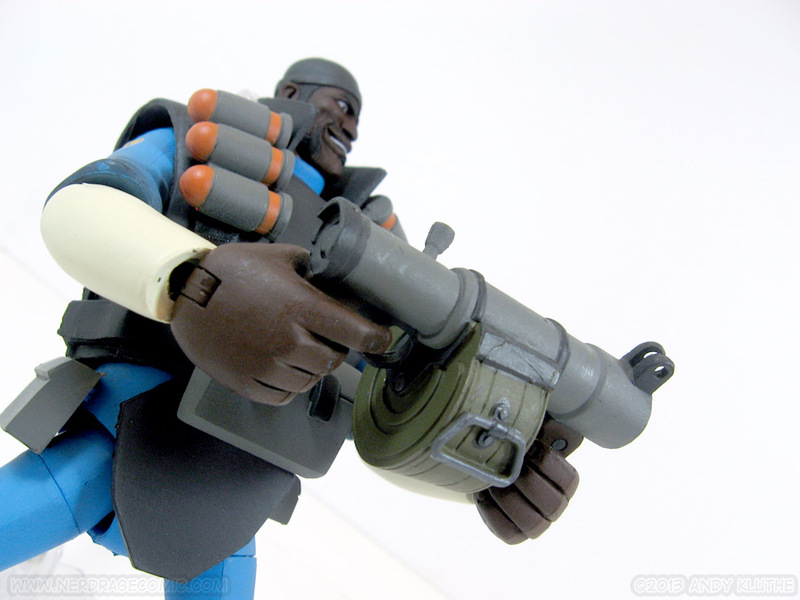 Demoman comes with the grenade launcher, sticky bomb launcher, an alternate hand for the stickybomb launcher, and a hand sculpted with the bottle. • Sculpting and paint jobs look good. 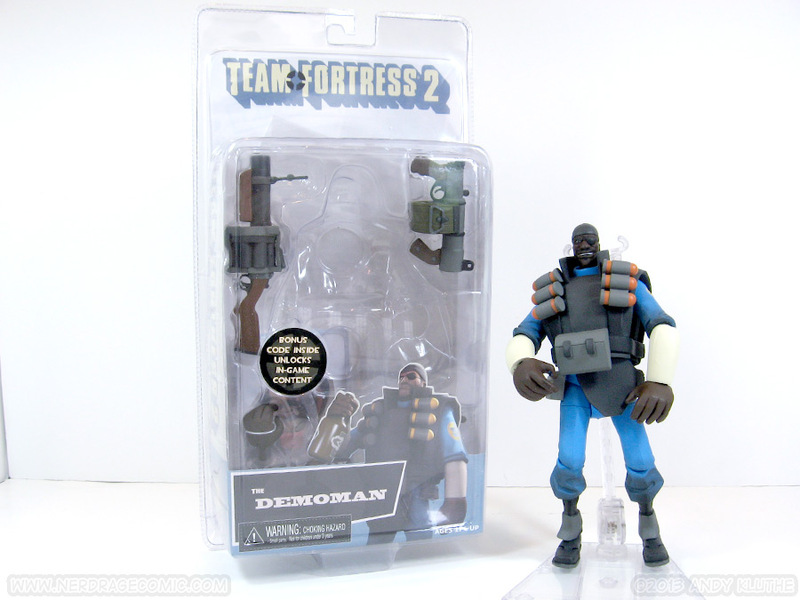 • Demoman comes with all his base gear. 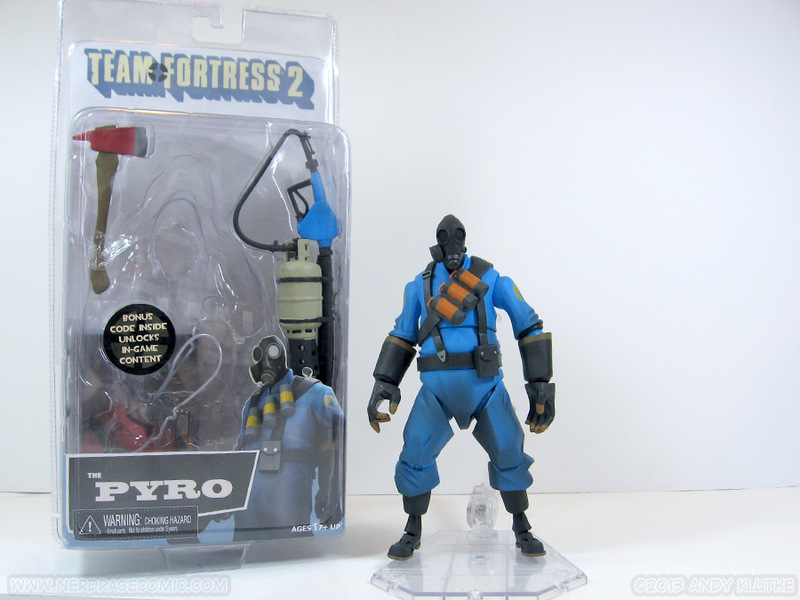 Pyro comes with…most of it. No accessories packs or alternate releases! The RED versions have been out for a while, so I knew what I was signing up for (ie: a lot of negative things). 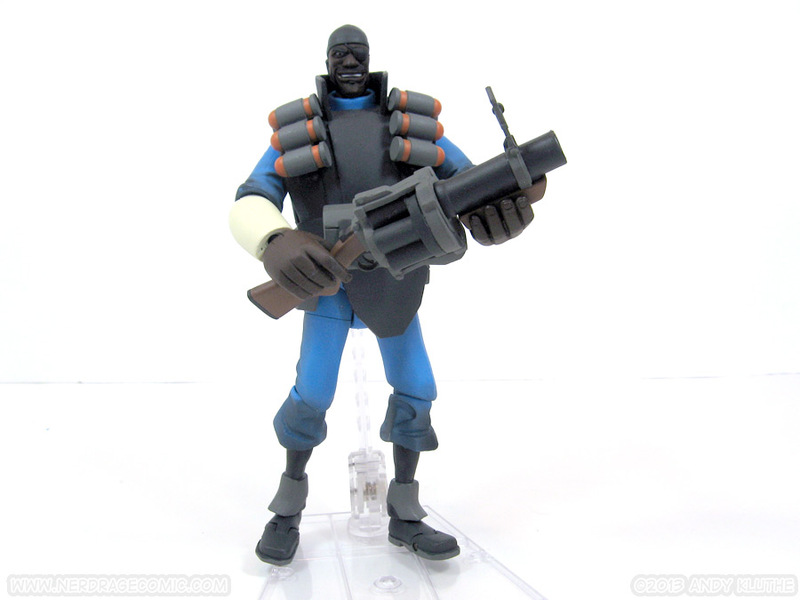 It really blows my mind how some of these paint issues made it into the final figure. Joints painted over. Painted pegs that go into holes? 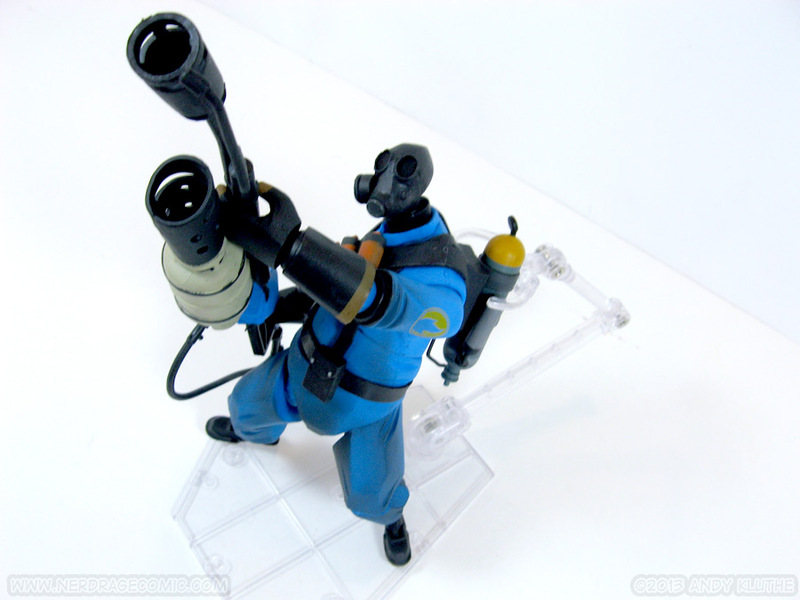 Why would you cast a solid hand in blue then paint it the appropriate color knowing various weapons are going to be pulled in and out of it? Stands would have also been nice, since these top heavy characters with teensy ankles just don’t stand well on their own. They have foot peg-holes, but there are no stands. Maybe an expensive additional purchase is on the horizon. 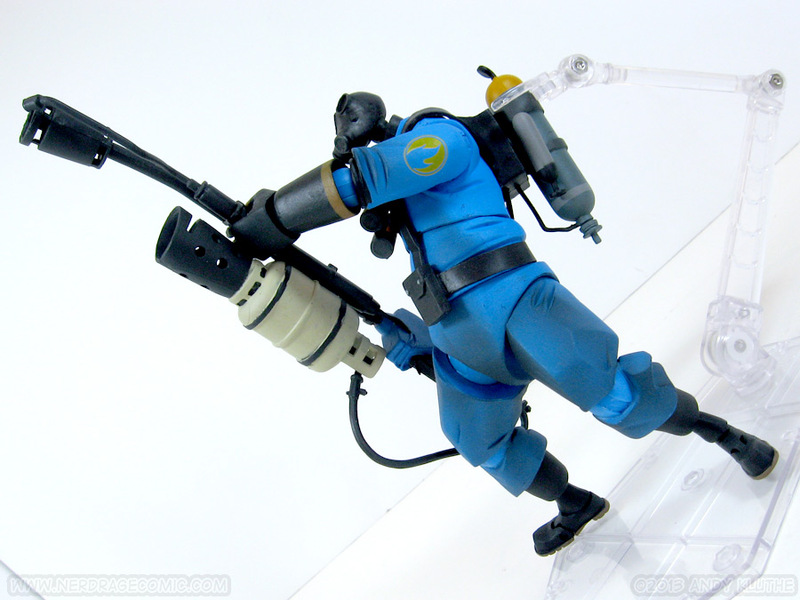 I commend NECA for trying new things with articulation, but it seems like the basics (elbows, wrists, etc.) shouldn’t be an issue at this point. Articulation and paint issues aside, once you have them in a nice pose they do look pretty friggin’ cool and very accurate to the games. You can hire your own mercenaries in a Toys R Us or comic shop near you. They retail for an MSRP of $23.99.